August 5, 2013 August 4, 2017 / Julie Brook, Esq. Direct examination is the best way to set the foundation for your case. Here are some tips to help you build that foundation brick by brick. Direct examination is the trial lawyer’s easiest way to prove what must be proved: as plaintiff, the elements of the case; as defendant, the contradiction of the plaintiff’s case or some different way of looking at the facts that negates plaintiff’s case. Make your questions easily understood. Phrase questions so that witnesses and jurors understand them without any effort. Be sure jurors can hear you. When questioning a witness at trial, always stand where the jurors can hear you. Be sure jurors can hear the witness. To help jurors hear a witness, stand far enough from the witness so that the witness feels the need to speak in a loud voice. Listen to the witness’ answers to your questions. A witness may not give you exactly what you expect, and you may have to rephrase the question. The witness may remember something new, and you must be able to formulate questions on the spot. Also, you may have to refresh the recollection of—or impeach—a witness who deviates from former testimony. Ask questions on every aspect of each important piece of evidence. Don’t cover key points perfunctorily. If you don’t bring out information that jurors wish to know, they may speculate on why in the jury room—to your client’s detriment. Appeal to jurors’ different learning styles. Individuals learn best in different ways, some by seeing a document or diagram, others by listening, still others by working with information in some way. Consider using demonstrative evidence as often as possible. 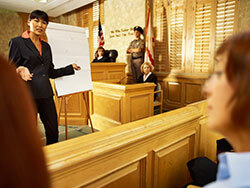 Try to tie your questions to objects or people in the courtroom, or into the demonstrative evidence you’re presenting. To involve jurors as much as possible, consider passing evidence among them. Make your questions interesting. Think of the trial as a play or movie and try to describe the events that led up to it as compellingly as possible. Make sure the witness that you present is interesting, understandable, and has relevant testimony on the issue you’re trying to establish. Put your witnesses on in strategic order. Try to have important witnesses testify when the jury will best grasp the content of their testimony. Consider what other witnesses and evidence you want jurors to hear and see before you call each important witness to testify. Try to ask questions that won’t be objectionable. In preparing your checklist of questions, think of any objection that may be made and be sure you provide a proper foundation to forestall that objection. Don’t argue with the witness. Your job is to persuade the jury, not the witness. Arguing with a witness is unprofessional and usually lowers your stature with the jury. Require the witness to testify to facts, not subjective conclusions. Don’t let the witness testify to opinions, assumptions, or beliefs, even when they are based on facts the witness observed, unless the testimony will enhance your case and you do not think your opponent will object. Don’t repeat questions. Avoid repeating what the witness just said. This is amateurish and annoying (e.g., “You say the car was red?”). Everything you need to learn how to conduct direct examination is in CEB’s Effective Direct and Cross-Examination, chapter 2. For an excellent primer on asking questions in deposition and at trial, turn to CEB’s Effective Introduction of Evidence in California, chapter 1. Also check out CEB’s program Developing Your Basic Evidence Skills: Relevance, Hearsay and Direct Examination, available On Demand. There are some great takeaways in the post. However , the most important point of direct is to tell a story.